I'm pleased to welcome the very first 2019 card to the Herschel Hoard. This is the base card from the 2019 Panini Prizm Draft Picks set. 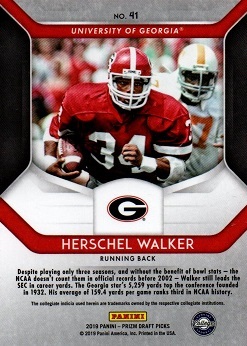 Herschel is one of the many college legends mixed in among current draftees. 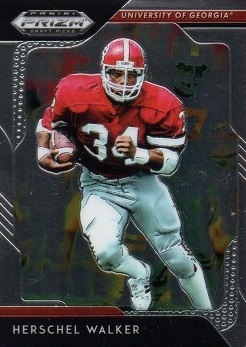 As is usual for Panini, there are a slew of parallels in the set. The following are #'d to 99: Silver, Blue, Orange, Pink Pulsar, Purple, Red and Red, White & Blue. Hyper is #'d to 75, Mojo to #49, Camo to #25, White Sparkle to #15, Gold to #10, Green to #5 and Black, which is a 1/1. As I get more parallels, I will post them.